Ibiza life and wellness coach Larah Davis, founder of Ibiza Retreats and Radiance Life & Wellness Coaching gives her tips on the art of time management and the importance of making dates with yourself this August! How are you feeling in the thick of the August heat? Are you keeping your pockets of you-time precious – even between many marvelous social events? Or are you feeling socialised out, drained or simply not as enthusiastic, like your candle-flame is slightly off-balance or even… burning out? Prioritising time for yourself amidst life’s many demands (and the whirlwind that is Ibiza-in-August) is truly an art form. Thankfully it can also be fun! It is possible to be artistically simple in prioritising your time through the use of colours… to help you remember, at a deeper level to focus on the areas that are important. The unconscious mind – which governs the running of our whole systems – is like a six-year old child: it loves simple, clear and colourful messages that look and feel fun. When you are in rhythm with your unconscious mind and doing what is really good for you, you stop relying on your already-far-too-full-and-exhausted-conscious-mind, effort falls away, you feel as though you are connected, in a good flow, obstacles diminish and problems dissolve. Life feels more balanced and like it is flowing easily. So keep it simple by first writing your 10 most important priorities – the ones that feel good to you to do, in order to keep your life fulfilling, positive, balanced and whole. 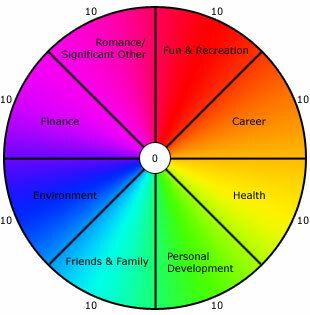 Now allocate each of these priorities a different colour (some may be the same) – check out the Wheel of Life below as a point of reference. For example, swimming at the beach could be blue, quality time with my partner may be pink, an evening walk in the pine forest is green, that cup of tea with a book in the morning sunshine might be blue, as is yoga on the terrace. Perhaps responding to client enquiries might be red. – What are your different colour categories? – What do these mean? Now begin your week ahead by making these important dates with yourself and pre-colouring in the times and dates around them in your diary. Remember to allow enough time before and after each event so you can avoid rushing from one thing to another! When you have lined up what you consciously want to prioritise with an artful strategy that colourfully prioritises your time and energy, you feel that time expands, you get things done more quickly and easily, you have more time for yourself, more energy and rather than beating yourself up for all the things you should be doing you can enjoy taking more of a back-seat, and enjoy life unfolding around you. This helps your whole being to feel more balanced, centered and relaxed, which means you can fully immerse yourself in all the delicious experiences that arise!